In November, you’ll get something extra when you buy the stamp of the month—50% off another stamp set! When you place an order of $50 or more in full retail products and buy the November Stamp of the Month set, Capture the Date, for just $5, you can pick any stamp set at 50% off! Get Capture the Date and then capture the savings today! *Shipping/handling may apply. Offer valid November 1–30, 2012. Offer valid for A–E and M size stamp sets only; K size, Workshops on the Go®, Cricut® collections, and Stamp of the Month stamp sets are not eligible for this promotion. 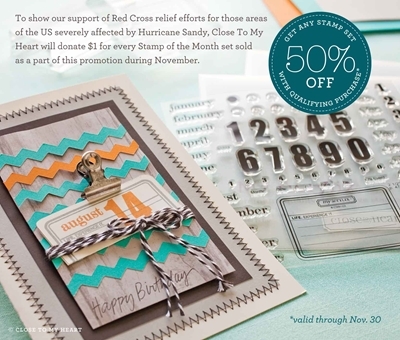 Maximum of one 50% off stamp set per order. As additional incentive, I will draw a name for the paper pack of your choice from everyone who joins the Support the Red Cross Gathering with a purchase between now and November 30!